A map of Gascony, showing a wide definition of the region. Other definitions may encompass a smaller area. Gascony (/ˈɡæskəni/; French: Gascogne [ɡaskɔɲ]; Gascon: Gasconha [ɡasˈkuɲɔ]; Basque: Gaskoinia) is an area of southwest France that was part of the "Province of Guyenne and Gascony" prior to the French Revolution. The region is vaguely defined, and the distinction between Guyenne and Gascony is unclear; by some they are seen to overlap, while others consider Gascony a part of Guyenne. Most definitions put Gascony east and south of Bordeaux. Gascony is the land of d'Artagnan, who inspired Alexandre Dumas's character d'Artagnan in The Three Musketeers, as well as the land of Cyrano de Bergerac, who inspired the play of the same name by Edmond Rostand. It is also home to Henry III of Navarre, who later became king of France as Henry IV. The Aquitanians inhabited a territory limited to the north and east by the Garonne River, to the south by the Pyrenees mountain range, and to the west by the Atlantic Ocean. The Romans called this territory Aquitania, either from the Latin word aqua (meaning "water"), in reference to the many rivers flowing from the Pyrenees through the area, or from the name of the Aquitanian Ausci tribe, in which case Aquitania would mean "land of the Ausci". Old historical literature[example needed] sometimes[when?] claims the Basques took control of the whole of Novempopulania in the Early Middle Ages, founding its claims on the testimony of Gregory of Tours, on the etymological link between the words "Basque" and "Gascon" – both derived from "Vascones" or "Wasconia", the latter being used to name the whole of Novempopulania. The word Vasconia evolved into Wasconia, and then into Gasconia (w often evolved into g under the influence of Romance languages; cf. warranty and guarantee, warden and guardian, wile and guile, William and Guillaume). The gradual abandonment of the Basque-related Aquitanian language in favor of a local Vulgar Latin was not reversed. The replacing local Vulgar Latin evolved into Gascon. It was heavily influenced by the original Aquitanian language (for example, Latin f became h; cf. Latin fortia, French force, Spanish fuerza, Occitan fòrça, but Gascon hòrça). Interestingly, the Basques from the French side of the Basque Country traditionally call anyone who does not speak Basque a "Gascon". His 1152 marriage to Eleanor of Aquitaine allowed the future Henry II to gain control of his new wife's possessions of Aquitaine and Gascony. This addition to his already plentiful holdings made Henry the most powerful vassal in France. 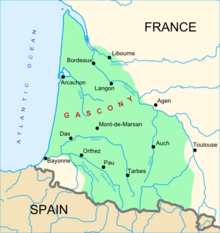 In 1248, Simon de Montfort was appointed Governor in the unsettled Duchy of Gascony. Bitter complaints were excited by de Montfort's rigour in suppressing the excesses of both the seigneurs of the nobility and the contending factions in the great communes. Henry III yielded to the outcry and instituted a formal inquiry into Simon's administration. Simon was formally acquitted of the charges, but in August 1252 he was nevertheless dismissed. Henry then himself went to Gascony, pursuing a policy of conciliation; he arranged the marriage between Edward, his 14-year-old son, and Eleanor of Castile, daughter of Alfonso X. Alfonso renounced all claims to Gascony and assisted the Plantagenets against rebels such as Gaston de Bearn, who had taken control of the Pyrenees. When France's Charles IV died in 1328 leaving only daughters, his nearest male relative was Edward III of England, the son of Isabella, the sister of the dead king; but the question arose whether she could legally transmit the inheritance of the throne of France to her son even though she herself, as a woman, could not inherit the throne. The assemblies of the French barons and prelates and the University of Paris decided that males who derive their right to inheritance through their mother should be excluded. Thus the nearest heir through male ancestry was Charles IV's first cousin, Philip, Count of Valois, and it was decided that he should be crowned Philip VI of France. Philip believed that Edward III was in breach of his obligations as vassal, so in May 1337 he met with his Great Council in Paris. It was agreed that Gascony should be taken back into Philip's hands, thus precipitating the Hundred Years War between England and France. At the end of the Hundred Years' War, after Gascony had changed hands several times, the English were finally defeated at the Battle of Castillon on 17 July 1453; Gascony remained French from then on. ^ "The Development of Southern French and Catalan Society, 718–1050". THE LIBRARY OF IBERIAN RESOURCES ONLINE. Retrieved 26 September 2010. ^ Chris Given-Wilson, ed. (2010). Fourteenth Century England VI: 6. London: Boydell Press. pp. 34–36. ISBN 978-1-8438-3530-1. ^ Previte-Orton, C.W (1978). The shorter Cambridge Medieval History 2. Cambridge: Cambridge University Press. p. 872. ISBN 978-0-521-20963-2. ^ Sumption, Jonathan (1991). The Hundred Years War I: Trial by Battle. Philadelphia: University of Pennsylvania Press. p. 184. ISBN 978-0-8122-1655-4. ^ Wagner, John A (2006). Encyclopedia of the Hundred Years War. Westport CT: Greenwood Press. p. 79. ISBN 978-0-313-32736-0. Wikimedia Commons has media related to Gascogne. Look up Gascony in Wiktionary, the free dictionary.